The sanctuary ring was a metal ring attached to the door of a church. A fugitive from the law had only to touch the knocker in order to claim the right of sanctuary. This allowed him to stay in the church, free from prosecution, for a period of time, usually 40 days. 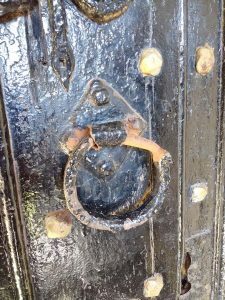 The most famous sanctuary knocker in Britain is that at Durham Cathedral, which is quite ornately carved, with a lion’s face, but a sanctuary knocker could equally well be a simple iron ring, usually set on a round iron plate affixed to the door. The right of sanctuary was abolished by law in the early 17th century. Sometimes the criminal had to get to the chapel itself to be protected, or ring a certain bell, hold a certain ring or door-knocker, or sit on a certain chair (“frith-stool”). Church sanctuaries were regulated by common law. An asylum seeker had to confess his sins, surrender his weapons, and permit supervision by church or abbey organization with jurisdiction. They then had forty days to decide whether to surrender to secular authorities and stand trial for their alleged crimes, or to confess their guilt, abjure the realm, and go into exile by the shortest route and never return without the king’s permission. Those who did return faced execution under the law and/or excommunication from the Church. Knowing the grim options, some fugitives rejected both choices and opted for an escape from the asylum before the forty days were up. Others simply made no choice and did nothing. Since it was illegal for the victim’s friends to break into an asylum, the church would deprive the fugitive of food and water until a decision was made. Henry VIII changed the rules of asylum, reducing to a short list the types of crimes which were allowed to claim asylum. The medieval system of asylum was finally abolished entirely by James I in 1623.